I was supposed to arrive on time for an event I was supposed to attend to. I had it all planned. I was to leave home and arrive at the Crowne Plaza Galleria exactly at 6pm. I arrived 640pm due to parking. 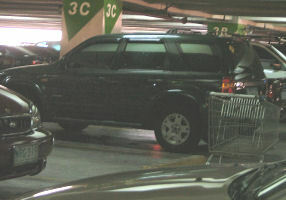 Robinsons' Galleria is one of those malls with so many people and so little parking space. Well it's not really little. It's just the way the parking was designed, and modified. I'll give you a backgrounder. Robinsons Galleria was the first place on the spot of that corner on Ortigas and EDSA. It had ample parking. Then came the business building which is attached to the mall. Holiday Inn, was also adjacent with direct access to and from the mall. Few years after, there came the RCBC bldg adjacent to it where an access bridge connected to the mall. And just recently, the newest hotel in the Ortigas center is the 5 star hotel Crowne Plaza Galleria, which is also adjacent to the mall. With all these buildings adjacent and including the mall itself, guess what ? Basement parking was never expanded. And so you have all those wanting to go to any of these buildings parking at the Robinsons Galleria basement parking, which makes parking a living hell. In addition, this is one of the most confusing parking lots where there's one way narrow roads and a lot of twists and turns. Don't get me started on Basement 3. It looks like a sewer. I was surprised to find traffic officers actually inside the parking lot directing cars. Is it that bad ? The only way to get a parking space at peak hours is to WAIT ! So a chunk of your parking fee goes to waiting to get an actual parking space. If I didn't need a car that day, I would've been better off commuting. Ok... I feel better now that I've ranted.